Huawei has made an unprecedented ascent over the past few years. The Chinese company has managed to work its way up from the cheap segment to the premium market in a very short space of time and is now the third largest smartphone manufacturer in the world behind Apple and Samsung. The director of the smartphone division, Richard Yu, set an ambitious goal in 2016: in the next five years he wants to reach the top spot worldwide. If that is going to happen then progress will have to continue at the same high rate of the previous year, as Huawei was able to increase smartphone sales by an unbelievable 29 per cent to 139 million units. 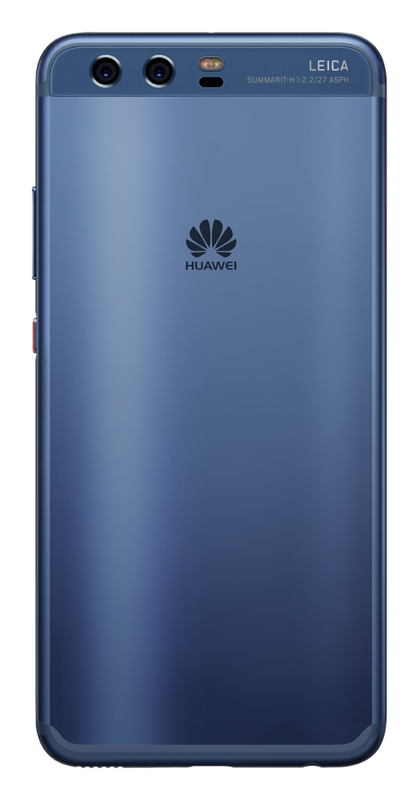 The P series models are a cornerstone of this success, forming the flagship of Huawei's product line. The Chinese company has been particularly quick out of the blocks this year, unveiling the P10 at the end of February 2017 at the Mobile World Congress in Barcelona. It's coming to shops in Germany in mid-March in two screen sizes: as the P10 with 5.1 inches and as the P10 Plus with 5.5 inches. The Plus model not only has the larger screen, but its technical features have been pumped up too: the biggest differences are the 2K display instead of full HD, larger aperture (F1.8 instead of F2.2), and more storage (6 GB/128 GB instead of 4 GB/64 GB). That said, the P10 model is more suitable for the masses; on the one hand its 5.1-inch screen is easier to handle, on the other hand its estimated price of €600 (official prices were not confirmed before press deadline) is within reasonable limits of what quality-conscious people are willing to accept. The Plus model is likely to be located on the other side of the €700 mark. The designers have accomplished a real feat and stepped up their game in comparison to the already very well-made P9 predecessor. The body has become much rounder, particularly on the back, which means the smartphone sits extremely well in the hand, although the dimensions have hardly changed. The P10 is two millimetres slimmer, but exactly as long as its predecessor and again extraordinarily thin with a design height of seven millimetres. The casing appears more closed, smoother, and more elegant, because the plastic inserts for the antenna have been incorporated into the aluminium to make them hardly visible and the fingerprint sensor has moved from the back to the front below the screen. The P10 is an eye-catcher that feels just as good as it looks. It will be available in Germany initially in silver, black, and gold. However, our favourite is the blue version, which will follow with a delay of a few weeks. Huawei has also changed the structure of the reverse: the aluminium has not been sandblasted. Instead, tiny prisms have been milled into the surface, giving the surface a slightly rough touch. Not only is the back particularly grippy, but the shimmering pattern made by the reflecting light gives the smartphone a special something. No one shows Huawei what to do in terms of design. Quite the opposite, the Chinese company is currently setting the standards for others. Considering these skills, it is incomprehensible as to why they have gone without an IP certification. The casing and motherboard have a showerproof coating so that the P10 can survive a shower without any problems. But who wants to take their chances when the manufacturer has yet to make any firm statements? The top models from Samsung and Apple are IP67/8 certified, meaning they are protected against temporary submersion. This is a chink in Huawei's armour. P10 presents state-of-the-art technology with potent hardware and an intelligent user interface. The 5.1-inch LCD screen is bright and offers a brilliant and high-contrast image in bright conditions (you can find the display test readings on the following page). The internal storage offers a meaty 48 GB of free space, which can be further upgraded with a micro SD card. The manufacturer has taken the chipset from the larger Mate 9, which is a good decision because the Kirin 960, produced by Huawei's subsidiary HiSilicon, fulfils the highest of demands and even keeps pace with graphically intensive apps. The octa-core clocks 2.4 GHz under load and is supported by 4 GB of RAM. Apps start quickly, the system reacts to every situation without delay, and achieved top positions in benchmarks. To make sure the tempo stays high even after long usage, Huawei has implemented algorithms in the system that analyse the app usage of the user via machine learning: when is Facebook opened, and the messaging app? Is there a pattern? The P10 parks frequently used apps in a cache, which the system always has quicker access to. How well this approach works will become clear in a few months. However, we think this is very exciting and want to point out that, according to Huawei, the data recorded remains on the smartphone, i.e. it does not migrate to the cloud and get analysed in any form. The P10 is installed with 7.0 and with the latest 5.1 version, as always covered with the EMUI interface. This is clearly different to the native Android, which in this case is not a criticism, because EMUI has been offering a consistent user experience since the fifth generation and brings lots of extras that are missing with Android. We particularly liked how the software developers integrated the newly positioned fingerprint sensor into using the phone. By using different finger movements (press shortly, press and hold, swipe across), the sensor completely replaces the navigation bar typical to Android. Given the well thought out interface, the absence of an intelligent assistant, like Siri, is quite surprising. There is not even a German voice activation on the P10: if you want to call the P10 out of standby mode, you have to use an English signal word. Furthermore, the interaction options are very limited and cannot be compared to Apple's Siri. Huawei has to raise its game here. Despite the ultra-compact design, the Chinese company managed to fit in a 3200 mAh battery. Comparing this to the current iPhone generation makes it clear just what an engineering feat this is: the iPhone 7, which is about the same size, only has a 2000-mAh battery and even the iPhone 7 Plus only has 2900 mAh. The small Huawei P10 brings along a larger source of energy than the 5.5-inch bolide from Apple. The battery life reached in the connect lab easily tops both Apple models: the P10 lasted 8:33 hours in our intensified duration test process (more on that topic on page 36), which is a very good result. You can get one or even one and a half days when using intensively and about two days with moderate usage. This is an excellent performance for such a compact smartphone. The icing on the cake is the 23-watt, quick-charge power adapter that comes with the phone and that fully charges the phone in 90 minutes.